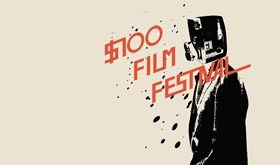 Calgary’s $100 Film Festival is a celebration of film. Not “film” as a concept, but of actual celluloid. This year, their 19th, is three nights of strictly 8mm and 16mm films — No Video! — screening at the historic Plaza Theatre on March 3-5. Each night starts off with a real bang: A unique live film and music performance by local musicians and filmmakers. Thursday features the combination of blues musician Erin Ross and a film by Farrah Alladin and Nathan Taylor; Friday is experimental indie band Axis of Conversation and a film by Alex Mitchell; and Friday is musician Kris Ip Ryzak and a film by Ben Tsui. Also on Friday, mixed in with the regular lineup of films, is a mini-retrospective of Montreal-based experimental filmmaker Alexandre Larose, featuring four of his films — Artifices, 930, Ville Marie and Brouillard. Then, after all films have screened for the night, Larose will host a half-hour long artist talk during which time he’ll discuss his filmmaking techniques, including his special camera modifications and use of hand-processing. In addition, throughout the fest there are several films by animator Jodie Mack, two films each by Underground Film Journal favorites Zach Iannazzi and Paul Clipson, a horror-comedy monster movie by Greg Hanson, the modern experimental classic The Tin Woodsman’s Home Movie #2 by Naomi Uman & Lee Lynch, a one-take Super-8 film by Noam Gonick, and tons more. Then, the fest will close on Saturday with an award ceremony with honors going for Best of Alberta, Best 16mm, Best Super 8, Jury’s Choice and an Audience Favorite. Below is the full lineup of films, but for more info, please visit the official $100 Film Festival website.